The White House’s online gift shop still offerings Barack Obama memorabilia, but since the 45th president has taken to scrubbing government websites of all that was decent and/or factual, there’s a good chance that items like this commemorative plate and creepy puzzle featuring Obama playing pool with dead presidents (and Bill Clinton) won’t be on the market much longer. Enter DMB’s “Thank You Obama” fashion line, which offers tour gear you might actually wear someplace other than the gym. That is, you could, if Joe Freshgoods’ website didn’t explicitly instruct you not to do so. The Chicago-based designer’s made it that much harder to resist throwing on the Malia T-shirt (whither Sasha?) by having Chicago’s favorite son Chance The Rapper model the line. 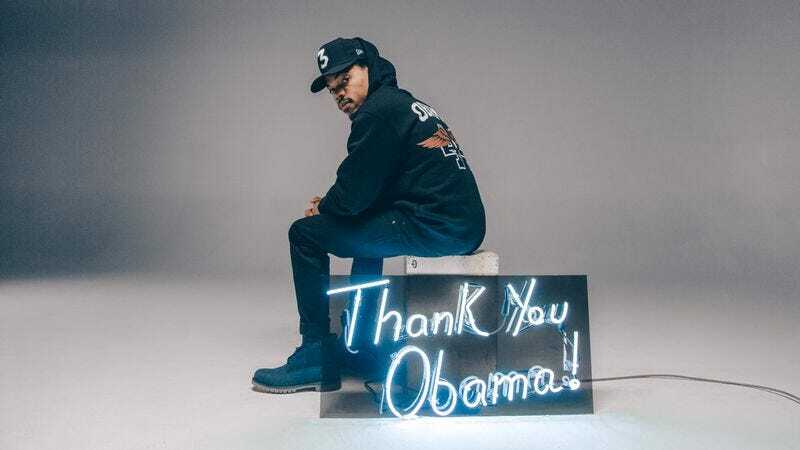 Former President Obama did cite Chance The Rapper as one of his favorite artists, and the admiration’s mutual. Chance poses in the long-sleeved tee thanking former FLOTUS Michelle Obama (and her Chicago public high school, Whitney Young) and the Obamas’ wedding anniversary tee, as well as the “King Barack” T-shirt that’s bound to give Trump some ideas. But Freshgoods says the line does more than commemorate Obama’s two-term presidency. It’s also a “timestamp” on “a period in my life where I felt like I can do whatever I wanted to do and be whatever I wanted to be. The night Obama won his first term gave me so much hope, especially, and most importantly as a black man. I decided to make a collection saying ‘thank you’ and give me something to smile at every now and then when I look in the closet.” The items are going fast, with the all-star jersey already sold out.